Microsoft's Cortana will be able to talk to Amazon Alexa and vice versa - this year! Alexa will be able to talk to Cortana, and Cortana will be able to talk to Alexa. That's the future of Amazon and Microsoft's personal assistants - and clearly the only way that both companies will be able to see off the challenge of the Google Assistant - not to mention Apple's continuing work to improve Siri. 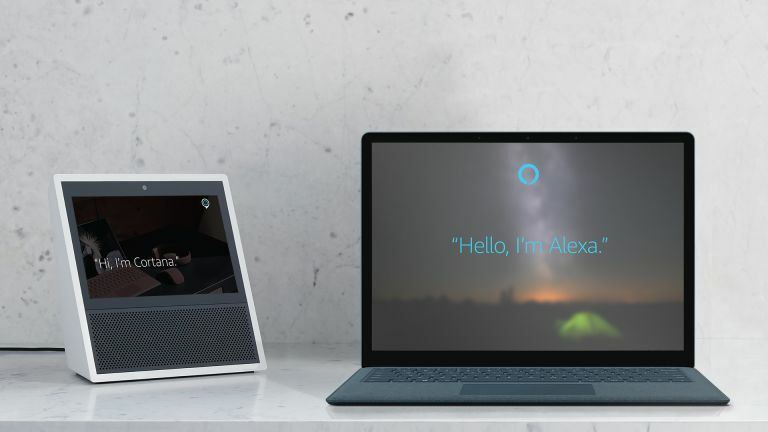 So in future you will be able to turn to your Amazon Echo device and say, “Alexa, open Cortana”, or turn to your Windows 10 device and say, “Cortana, open Alexa”. Great stuff, huh? We don't have a date for the collaboration, only that we know "Alexa and Cortana will begin talking to each other later this year". Alexa will be able to access Cortana’s meeting booking or accessing work calendars or reading your work email via Office 365. Cortana will also be able to ask Alexa to control smart home devices (great for Microsoft, since Cortana is nowhere with this) and shop on Amazon. Naturally it also gives Cortana access to Alexa's third-party skills, now numbering more than 20,000. According to the New York Times, the two giants have been working for around a year on the collaboration, which started when the two CEOs of the companies met up at a conference in May 2016. Despite such large-scale collaboration being rather unusual, it seems that both companies felt that their assistants were being held back by not working well in key areas. Alexa's weakness is in calendaring, email and business tasks (which Cortana is great at via Microsoft's ownership of Windows, Office and Outlook), while Amazon's assistant has the smart home - and device integration - nailed via many partnerships. Cortana doesn't have this connection with smart devices. “Ensuring Cortana is available for our customers everywhere and across any device is a key priority for us,” says Microsoft's Satya Nadella. “The world is big and so multifaceted," adds Amazon's Jeff Bezos. "There are going to be multiple successful intelligent agents, each with access to different sets of data and with different specialised skill areas. "Together, their strengths will complement each other and provide customers with a richer and even more helpful experience. Could Apple or Google join the alliance? Interestingly, Bezos said he would "welcome it" if Apple or Google were to join up with the pair. Of course, Apple and Google do have vested interests in keeping their assistants separate from anybody else's - they are key parts of their respective mobile operating systems; iOS and Android. Apple especially is renowned for its closed ecosystem. Nils Lenke, head of research at Nuance, says that the collaboration raises some interesting questions for everyone working in the area of voice recognition and artificial intelligence. "On the one hand, it confirms what we have been saying for a long time: assistants should be specialised in specific areas, rather than creating a 'jack of all trades, master of none' scenario. "The most exciting question is: How exactly do two virtual assistants, two artificial intelligence solutions, work together? "Well, first of all, the AI solution must know what it does not know, and what the other does know. Alexa should know what Cortana knows to be able to decide who ought to respond to a specific inquiry - and vice versa. As things stand, you'll need to be specific that you want to use the other assistant, saying something like "Alexa, ask Cortana if I have any appointment today". But, as Lenke points out, it would be much better if both interoperable AI systems knew where they should go for the answer to your question without you having to be specific about the assistant. "Depending on how well the interactions with other AIs work and how satisfied the human user is with the results, the model can be refined over time."